Without much fanfare Adidas appears to have become the most successful direct-to-consumer brand on eBay. The adidas_official seller joined eBay in September 2016, and have since grown to be one of the Top 50 eBay sellers. Based on the seller feedback reviews received Adidas store had a slow ramp up until March 2017, then grew considerably and had a solid rest of 2017 with Christmas sales lifting them even higher. After Christmas sales have naturally decreased, but have since continued to grow to reach all-time highs. Each seller on eBay receives seller feedback reviews from customers after a purchase, and this can be used to approximate the relative growth or decline in sales of a given seller. Providing feedback is optional for customers, but on eBay most customers do. Adidas store on eBay has over 10,000 listings, all new items sold at fixed price (instead of an auction), but does not offer guaranteed 3-day shipping yet. Items on offer appear to mimic the catalog available online on the official adidas.com website. Pricing matches the website pricing too. There hasn’t been an official announcement from Adidas or eBay celebrating the launch. However Adidas was one of the first large brands to understand the value of marketplaces - in July 2014 Adidas lifted the ban to sell on marketplaces, allowing retailers to sell on Amazon and eBay. They have previously banned sales on marketplaces in January 2013. At the time analysts called the move “an act of desperation” that will benefit Under Armour and, to a lesser extent, Nike. “The lack of restriction will likely cause Adidas to become a more promotional brand, and likely suffer the wrath of its better wholesale partners, which would then be very positive for Under Armour,” Sterne Agee analyst Sam Poser wrote in a research report. However earlier this year eBay released “Top Shopper” report which revealed that Adidas Superstar earned the top spot as the most popular sneaker of 2017. Data revealed that 107,000 pairs of Adidas Superstars were purchased last year, beating out the Reebok Classic (28,000 pairs) and the Nike Cortez (24,000 pairs). 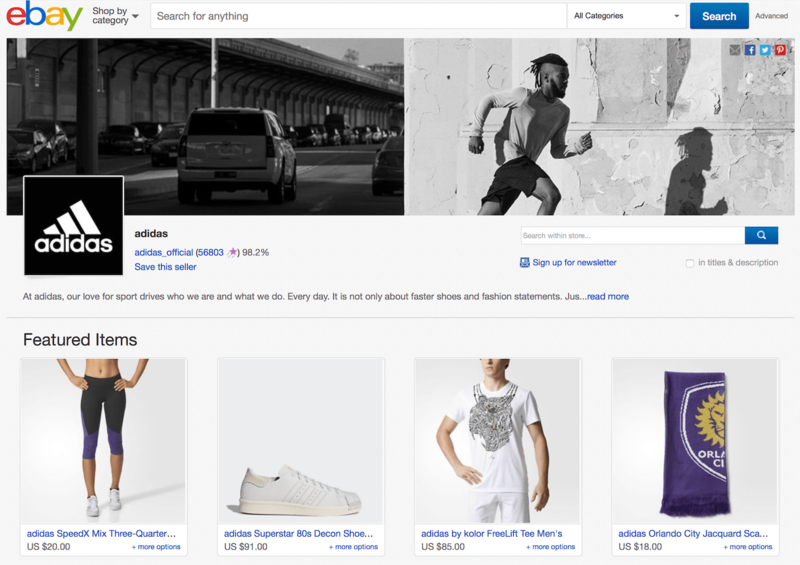 eBay wants to become a platform brands use to sell direct-to-consumer. They have been making changes, and have already announced more changes to come designed to make brands succeed on eBay. Despite the $36 billion in sales in the US, brands rarely think of eBay as a channel since historically most items sold on the site were coming from the tens of millions of third-party sellers. Nothing on the Adidas store on eBay look special. The store itself doesn’t use a custom design, an otherwise popular choice, listings use a fairly standard template, and they are yet to join the new programs like the guaranteed 3-day shipping. There isn’t anything to stand out explaining why Adidas has grown so much. But they do have a large catalog and the same pricing on eBay as they do on their website. Given the 170 million users on eBay that appears to be enough. Founder of Marketplace Pulse, Joe wears multiple hats in the management of Marketplace Pulse, including writing most of the articles. Based in New York City. Advisor to other startups and entrepreneurs. Occasional speaker at conferences.